All Saints Theatre is a company limited by shares and owned in part by a charity called Thea and in part by the actors in the company's first production in March 2005 (pictured opposite). The primary object of the company is to commission and produce musical drama for public performance. All Saints Theatre aims in pursuing this object to support young professionals in the development of their acting and musical talents, and to be a theatre for the extraordinary ordinary person. This ambition encompasses the characters that it presents on stage, the actors that it asks to represent them, and the people that it invites to see its productions. There is an extraordinary person in every one of us, and All Saints Theatre aims to inspire that person to expres this extraordinariness in constructive and entertaining ways. 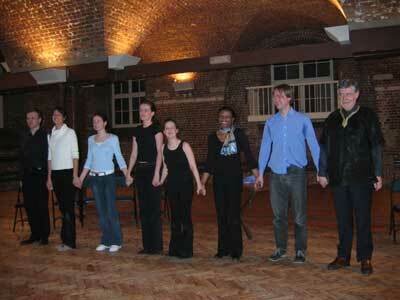 We are based in South East London and rehearse at All Saints Community Centre, 105 New Cross Road, London SE14 5DJ. Our performance space has been recently refurbished and can seat an audience of 200. You can see pictures of the hall and the stage by clicking here.